The YF series of dc/dc converters perform over an ultra-wide input voltage range (2:1 and 4:1), providing indefinite short circuit and overvoltage protection. This design technology provides upt to 20 watts of output power from a 1.60″ x 2.0″ x 0.40″ case. These current mode control forward converters are designed for improved transient response and reduced stress on switching components and do not require external input filtering, making it a preferred source over industry alternatives. Dimensions: 2in. × 1.6in. × 0.4in. Notes: 1. MTBF:BELLCORE TR-NWT-000332. Case I: 50% Stress, Temperature at 40°C. (Ground fixed and controlled environment). 2. All DC/DC converters should be externally fused on the front end for protection. 3. The output requires a minimum loading on the output to maintain specified regulation. Operation under no-load condition will not damage these devices, however they may not meet all listed specification. 5. 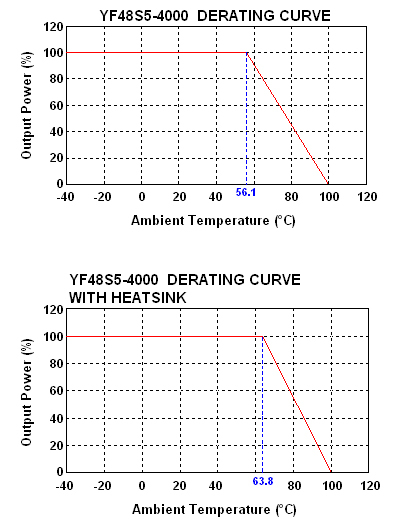 Heatsink is optional (for operation temperature range please see derating curve). Contact Factory for ordering details. 6. Significant capacitive load on output may inhibit start-up and operation, consult factory. 7. The YF/YFW Series can meet EN55022 Class A with an external capacitor in parallel with the input pins. 8. 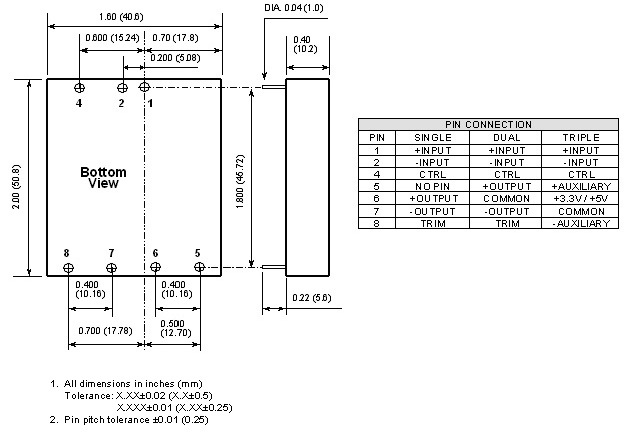 An external filter capacitor is required if the module has to meet EN61000-4-5. 9. The YF Series is 2:1 wide input range of 9-18VDC, 18-36VDC, and 36-75VDC. The YFW Series is 4:1 ultra wide input range of 9-36VDC and 18-75VDC. 10. Maximum case temperature is 100°C.